Hurry! The Deadline for Scholarship Applications is fast approaching! The Invest in Others Scholarship Application deadline is Friday, November 30th. 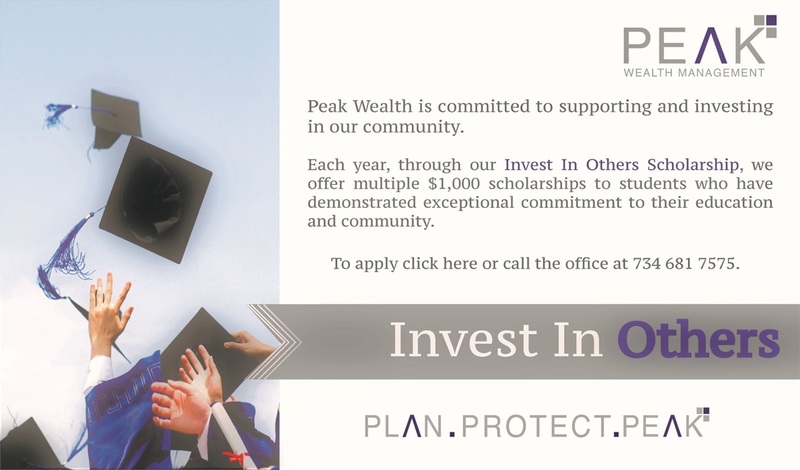 Each year, Peak Wealth Management awards multiple $1,000 scholarships to deserving college or college bound students. If you have a child or grandchild who you feel would be a good candidate, please encourage them to apply by clicking here. Peak Wealth Management is a full-service Registered Investment Advisor located in Plymouth, MI. We believe by providing education and guidance, we inspire our clients to make great decisions putting them on a path toward fulfillment and their own definition of true wealth. Over the last 15 years, we've donated over $30,000 in scholarships. We are financial planners in Plymouth MI who support the local community!